I was sorely tempted this week, but I resisted. Over the many years now that I’ve run the TBR Dare, it’s gotten much easier to do. The first year was tough, very tough, but now sticking to my own TBR shelves for the first three months of the year has become kind of a habit. But February is still a difficult month. Six plus weeks into the TBR Triple Dog Dare new titles can be very tempting. And it’s just about impossible for me to stay out of bookstores after three or four weeks. And I had this past week off, which did not help things. I spent the week reading four books at a time, which I sometimes do. I’m currently reading Those Who Leave and Those Who Stay, book three in Elena Ferrente’s (Not her read name) Neapolitan Quartet; A Man’s Head by Georges Simenon; The Thoughts and Happenings of Wilfred Price, Purveyor of Superior Funerals by Wendy Jones and still working my what through The World Rushed In by J.S. Holliday. I read each in 50 page chunks, two or three books a day. So, I’ve no business thinking about getting more books to read. I do have over 200 in the TBR bookcase in my studio downstairs. But we found this Ace Double in an antique store up in Santa Rosa and I had to have it. 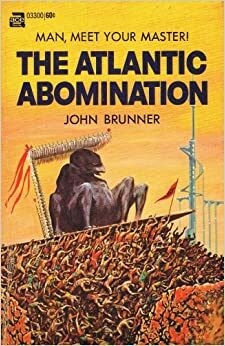 Read The Martian Missile then flip the book over and read The Atlantic Abomination. Two books in one. I have a very small collection of these Double books, some Ace and some Tor. I think they are a great idea that kids today would love. 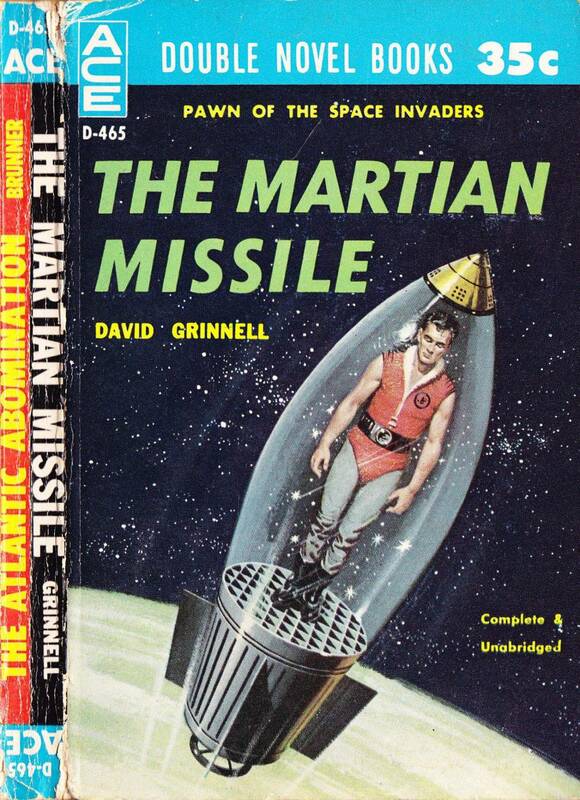 And I really wanted to dive right in to The Martian Missile. But I resisted. It will have to wait until April 1. As will Walt Longmire. My local bookshop, Bookshop Benicia, has the complete Walt Longmire series on the shelves, tempting me. I’m a big fan of the television show but I’ve never read any of the books. Up in Santa Rosa yesterday, I visited Paperbacks Unlimited, where once again I found Walt Longmire sitting on the shelves, the first book in the series, too, at half price. I resisted again. To add to this temptation, Melville House sent me two more novellas, I subscribe to their The Art of the Novella series. All of these went into the basement where they wait in a special pile until April 1 when it’s open season. I did get Michel Houellebecq’s new book Submission from the library but this was a very late addition to my hold’s list, made late December 31, 2016, so it does not break the official TBR Triple Dog Dare rules. Of course, you are allowed to break the rules when needed and to make your own. So I’m sticking to my TBR stack for five more weeks. March is actually much easier than February. In March you can see the end approaching so putting off that new title you just have to start on is easier to do the closer you get to April 1. For many years I celebrated April 1 with a trip to City Lights Books in San Francisco. City Lights always managed to have lots of books I’ve never heard of that I absolutely must have. That’s what makes a great bookstore in my opinion. This year, I will be in Los Angeles at a conference on April 1, so I’m going to go to The Last Bookstore which I’ve read so much about. Apparently, they have an enormous second floor full of one dollar books. And, I’ve found my first TBR treasure, The Promised Land by Grace Ogot. An old paperback, yellowed quite a bit, that I have no memory of buying. Probably sat on my TBR stack for years. I also loved Flaubert’s A Simple Heart much more than I expected. So keep the faith, people. Just six more weeks to go. The next two are toughest, but if you can get through those 14 days, you’ll just slide in to home. I’m gearing up to plunge into the Ferrente books. I keep hearing so much about them, but every time I pick up the first and read the back synopsis, it doesn’t do much for me. However, I know I need to have more faith in all the positive reviews! They are much more interesting than the description of them. I found I was completely caught up in the story-line about making a shoe factory which is not something I would have expected at all. And you can stop after the first one if you want. The second one ends with a cliff-hanger but the first one not so much. 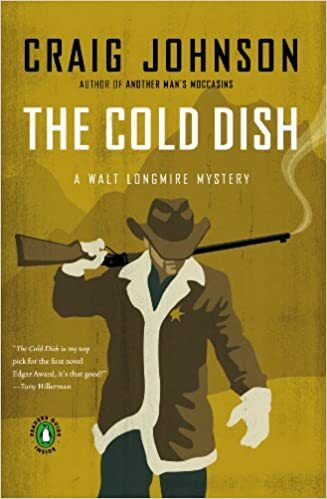 I’m also a Walt Longmire fan (TV) so last year splashed out & ordered one book – online; expensive for me, because I have to pay in US dollars & our currency is terribly weak. Can’t say I enjoyed it – still love the TV series. Your TDD fortitude is praiseworthy! Inspired by you, I haven’t bought a single book yet – and here we are in mid-Feb! my bank account thanks you. I kind of thought that, but I’m going to read one of the Longmire books anyway. I’ve long held that mediocre books make the best movies/television shows. Great books only rarely make for great movies/television. I haven’t had any problems this year sticking to reading from my own TBR piles. Amazingly, I also have not had any real temptations to buy anything. I do have a list to look over in April. I almost started a list, but I held back. I figure if I don’t get the Jan-March books I heard about on a list, there will still be plenty to list in April. And it may just be a good idea to wait around for top ten lists at the end of the year anyway. I haven’t really had any temptations to stray lately, probably because I’ve just been avoiding the library … though yesterday my boyfriend and I stopped into a New York Public Library branch (as opposed to the Brooklyn Public Library branch we normally go to) and I very pointedly did not look at the “new books” shelves while he signed up for a library card! Earlier this year we got cards for the San Francisco Public Library, so I know what you went through. I have done so well with this dare and have recovered from my reading slump, so I am thinking I might just go the whole of 2016 reducing my TBR pile and not buying any new books. I will be making the library ok in certain circumstances. Another thing I have done is to make up four challenge lists: two lists are fiction and nonfiction books A-Z by author’s last names and two more lists are A-Z titles, fiction and nonfiction. Each list has a couple of unusable letters, of course, but I should knock off at least 100 books overall during the year and reduce my TBR substantially, but not totally. So far I have enjoyed my little plan and I haven’t had any real interest in or temptation to purchase more except for one you recommended, A Nation Rising, which I have placed at the very end of my challenge lists for nonfiction if I should need a replacement for some reason. I checked with my library before ordering a used copy from Amazon. I am reducing clutter and saving money at the same time, because I am requiring myself to get rid of every book I read that I figure I will never read again. It has been great fun! I’m so pleased to hear that you’re enjoying The TBR Triple Dog Dare so much. And I do admire your ambitious plan. I find that I buy about 2/3’s as many books as I read during the TBR Dare so I get just a slight overall reduction in my TBR bookcase. But I don’t allow it to grow larger than the one bookcase…. You could read it in secret. Under a blanket with a flashlight…. Exceptions are allowed for special circumstances, you know. I just read one of my claimed exemptions, but otherwise I have been sticking to the TBR shelves. I’ve bought quite a few books, as usual – I’ve just stacked them up for April 1st. I find it fascinating reading about everyone’s progress and struggles. I am still reading from my TBR except I requested a few review copies to review for Shiny New Books and had NO IDEA the one I was sent was going to be that big. So now the TBR is a shelf, double-stacked, with piles on top. Oops.